Do you feel lonely at times and wish you could share special moments? Have you ever remarked on the beauty of a rainbow, only to discover there’s no one there to hear your gasps of delight? Do you sometimes get so caught up in the hustle and bustle of the day that you forget to notice little glimmers of magic, and do you sometimes feel too overwhelmed and stressed to appreciate the simple joys of being alive? In December I was supposed to fly to Vietnam with my parents, but due to some airline mishaps, I ended up getting separated from them and had to make the approximately 36-hour journey by myself. Since I’d been expecting to travel with my parents, and my dad had made all the arrangements, I hadn’t paid much attention to the ins-and-outs of getting to our destination. Despite having flown on my own numerous times, I was feeling surprisingly daunted by the idea of a seven-hour layover in the middle of the night alone in Saigon and having to navigate a sea of people in an unknown land to purchase a flight to Da Nang. When I mentioned my anxiety to my friend, Kyla, she suggested I imagine a small version of her keeping me company and pointing out all the cool and wondrous things along the way. My shoulders began to relax and my breath deepened as I realized that this solo journey could actually be a lot of fun. Kyla has a keen ability to see the best in each situation and find magic everywhere she looks. For instance, one time at Disneyland, she even managed to make getting trapped on a ride for an hour feel like a blessing. So, I knew that with her voice in my head I was in for a joyous adventure. 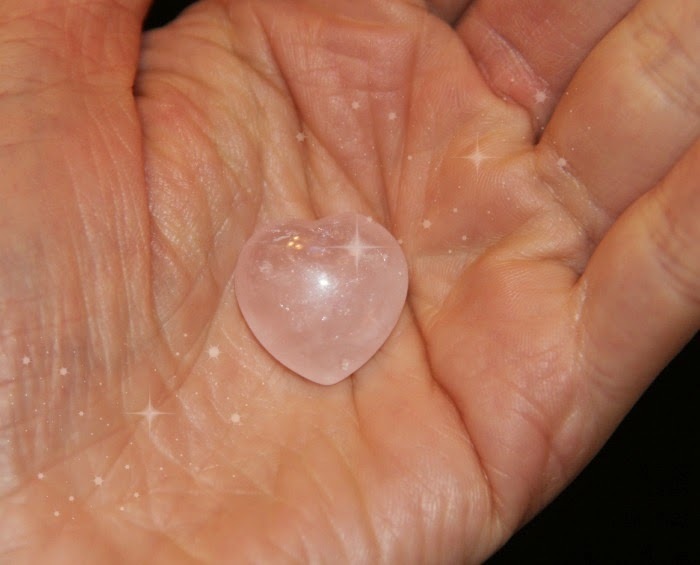 Just before embarking on the first leg of the journey, I put a small heart-shaped rose quartz crystal in my pocket and decided to call it “Mini-Kyla.” I liked the idea of having a physical object to represent my imagined companion. Every time boredom, fatigue, or loneliness set in, there was Mini-Kyla in my pocket remarking (in my imagination) on the friendliness of the cabin crew, the array of food options in the Hong Kong airport, and the thoughtfulness of the United pilot who gently woke me so I wouldn’t miss my flight from Hong Kong to Saigon. What started simply as a way to find pleasure in a long overseas flight has become a wonderful new habit. The rose quartz (Mini-Kyla) is now in my pocket every day. If I’m in a bit of an uncomfortable situation, I gently touch the outside of my jeans pocket, and I feel its love and support. And, if I’m watching a particularly glorious sunset, somehow it feels as though it’s also sharing in my joy. But, most importantly, having the stone in my pocket reminds me to enjoy and appreciate simply being alive. It’s so easy to get caught up in work or family commitments and forget to cherish the beauty of our breath and the rhythm of our beating heart. So, some days I will stop halfway through composing an e-mail or pause while washing the dishes and ask, “What would Mini-Kyla appreciate about this very moment?” Even though Mini-Kyla is just a small stone buried in my pocket, this exercise makes me take time to feel increased gratitude and harvest even more joy. When Kyla suggested I picture her keeping me company during the flight, she likely had no idea that Mini-Kyla would end up taking on a life of its own, but I’m so grateful to have the comfort of the stone in my pocket and the daily reminder to create moments each day that fill me with wonder and awe. What do you want to be reminded of daily? Just like tying a string around your finger or writing a note on the palm of your hand, Mini-Kyla prompts action. If you had a small object in your pocket, what would be its purpose? What gifts would you gain from its presence? What would you call it? “Mini-Kyla” is the name that has stuck with me, but I suggest you choose a name that resonates with you, though you can, of course, also call yours “Mini-Kyla,” if you desire. You don’t have to call the object anything, but for me… giving it a name has brought it to life. Here’s to savoring each and every day! 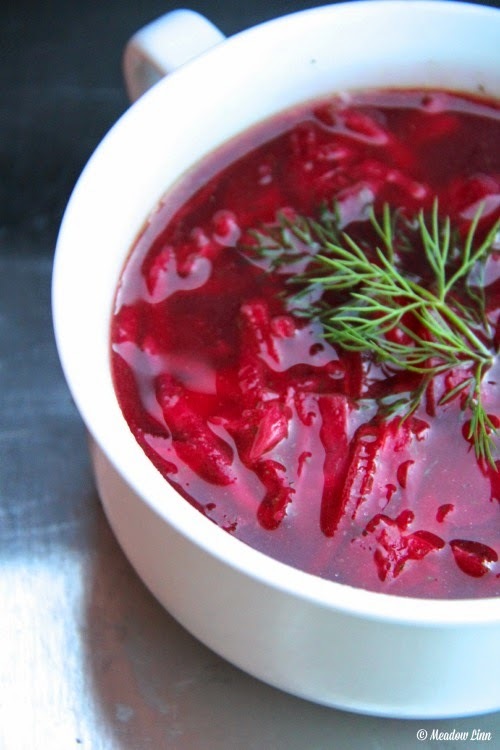 When I was making a pot of this the other day, from the depths of my pocket, I could practically hear Mini-Kyla squealing in delight at the magenta color. Not only is this soup a delicious balance of sweet (from the beets) and sour (from the vinegar), but also it’s stunning to look at. I also love how it’s a metaphor for the harmonious balance of the sweet and sour aspects of life, just in the way that Mini-Kyla reminds us to see joy and wonder even when it seems there’s none to be found. To make this soup heartier, use chicken broth in place of the water and add a pound of boneless, skinless chicken thighs. In a 6 qt. pot over medium heat, sauté the onion and garlic in the olive oil, salt, and pepper, until soft and translucent, about 10 minutes. Meanwhile, peel and grate the beets with a food processor or with a box grater. Add the beets to the pot. Slice the cabbage (you can also use the food processor, but I prefer to do it by hand). Add the cabbage and dill to the pot, and stir to combine. Add the water and vinegar. Increase to medium-high and bring to a gentle boil. Then, reduce the heat to medium and simmer for an hour, or until the beets and cabbage are tender and the flavors have melded. Add salt and pepper, to taste.